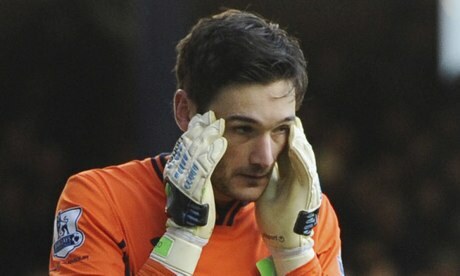 It turns out Lloris wasn’t concussed, though Tottenham’s coaching staff couldn’t possibly have known that during the game. Even if Lloris claimed he was well enough to play, AVB should have substituted him: players lie about injuries all the time, especially in the super-macho world of English football. The Premier League isn’t the NFL, where head-to-head collisions are both commonplace and an important part of the sport’s appeal. However, it’s almost inconceivable that American football’s “110-percent-never-give-an-inch rhetoric,” which has promoted both on-field recklessness and off-field harassment, doesn’t exist in Premier League dressing rooms. It’s possible that the English FA will respond to all the recent bad publicity with a new “respect the brain” campaign, a series of “Let’s Kick Reckless Machismo Out Of Football” billboards, and a seminar on concussions attended by all 20 Premier League managers. But as great as that would sound in a press release, it wouldn’t actually change anything. AVB and his ilk would listen, applaud, shake a few hands, and then return to the business of doing whatever it takes to win football matches. This FA initiative would actually work: sending independent doctors to every Premier League game to assess head injuries and administer comprehensive concussion tests. But here’s the thing: the FA is even more dysfunctional than FIFA. It’s run by men who know little about governing and even less about football. It’s one of the many reasons England hasn’t won an international tournament since 1966. It’s been on the wrong side of history more times than I can count. In theory, the FA has enough legislative authority to protect players from brain injuries. But I seriously doubt it is disciplined enough to design and implement a policy change more rigorous than printing a few thousand Say No To Concussions t-shirts.